Throughout these posts, we are talking about all things Summer Safety. These posts contain information & resources that I have been able to compile as a fellow parent, but I am not a medical professional, & you should always seek professional help for any concerns. I also encourage you to use these resources as a starting point & do more research on any of your particular concerns as well. All of that being said… it’s summer, have fun! It is important to spread awareness that drowning does not necessarily look the way that it is presented in movies. People who are drowning are not able to call for help or wave their arms; the body is focusing on trying to get any gasps for air that they possibly can. When drowning, a person’s head will bob up & down trying to get the mouth above water before sinking again. It is also instinct for a person’s arms to go out to the side & try to press down on the surface of the water. When drowning, the body resorts to instinctive movements, & there are not conscious thought patterns or purposeful movements or speech. It is strictly survival mode, & people are not able to reach out for help. Information about dry drowning (or secondary drowning) is thankfully making it’s way around the internet, raising awareness to this issue. The scary thing about these issues is that they can have a delayed effect where you may not see symptoms until up to 24 hours later. Symptoms may include trouble breathing, chest pain, coughing, & feeling very tired. Of course, children who have been swimming all day may display signs of being very tired & irritable anyway so it is something to keep an eye on & check with a doctor if you have any concerns. These situations are very rare, but it is always good to be aware. Swimmer’s Ear is common over the summer because water can stay in the outer ear canal & breed bacteria. The best treatment is to prevent the condition from occurring or getting worse. There are prescription ear drops available for later stages of swimmer’s ear, but you can also create an ear drop solution to be used regularly at home to prevent this condition. Whether you are heading out on a boat or simply going to the neighborhood pool, proper life jackets are so important! Have child lift their hands above their head. If the life jacket, hits the child’s chin or ears, it might be too big. Our family’s top pick for life jackets are the puddle jumpers. The puddle jumper shown below is U.S. Coast Guard approved, & they are so comfortable for kids! My boys hated wearing life jackets until we found these. They help them swim more naturally & give them more control over their bodies. Some traditional life jackets tip your forward making it hard to keep your head above the water, & arm floaties by themselves can be very dangerous because they can fall off or deflate. These puddle jumpers combine the chest flotation with the arm floaties so that kids can get around & stay safe. 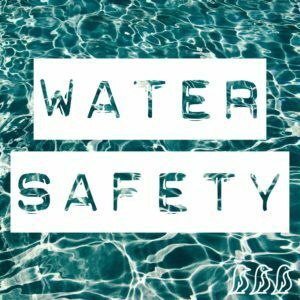 Rafts, inflatable boats, tubes, etc can be a lot of fun to play with in the water, but they can be dangerous! People can get stuck under rafts, lose their bearings, & have trouble resurfacing. Inflatables seem lightweight & easy to maneuver, but if you are underneath one of them, you can’t press it up off your head because you don’t have any leverage to press against (you just sink down instead of the inflatable going up). If you are using these types of toys & rafts, be extra vigilant about watching your children. They can be a lot of fun, but as with anything else… caution is needed. Life jackets are crucial any time you are going boating, but it is also important to teach your kids general boat safety before heading out.